"Pocket Royals is a carefully curated collection of characters, costumes, and accessories that both familiarizes us with the royal family's nuances and questions the themes of King Charles III." 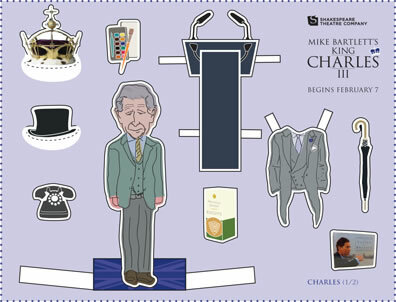 Now you can coronate England's Charles, Prince of Wales, as King Charles III with your own Pocket Royals paper dolls available for download from the Shakespeare Theatre Company (STC) website. The free PDF toys are part of the Washington, D.C., theater's promotion of Mike Bartlett's iambic pentameter play King Charles III, which began its month-long run this week. "Pocket Royals is a carefully curated collection of characters, costumes, and accessories that both familiarizes us with the royal family's nuances and questions the themes of King Charles III," says an STC email to patrons. "The Pocket Royals series takes a page out of Mike Bartlett's book by creating a world of royals with which to play, asking how [William] Shakespeare, Bartlett, and we ourselves tell stories and create history." A link takes the reader to an Asides page—the theater's educational publication for each of its productions—with more biographical information on Prince Charles. From there you can download two PDF pages featuring cut-out figures of Charles plus such accoutrements as a coronation robe, military uniform, top hat, wellies, kilt, umbrella, box of biscuits, and, of course, a crown.